Dawn, Lauren, and I saw Arrival earlier this evening, then proceeded to chatter like magpies all the way home. We were entranced. It’s a wonderful, emotional, rather potent think piece. Because Lauren remarked, “It’s probably one of my favorite movies of all time,” this review is brought to you by both of us! We shall keep it shorter than it could be, as it’s 2:00 AM after a long election night. If you liked 2001: A Space Odyssey, Alien, The Abyss, Contact, Gravity, and Interstellar, you’re in for a treat! Each features a strong, clever, female protagonist standing her ground while solving a puzzle in a macho world. In Arrival, Amy Adams brings similar heat. (I know, I know, not everyone is an Adams fan, but Lauren and I have always enjoyed her work, from lighthearted farces like Enchanted and The Muppets to layered, stylized outings like American Hustle and Big Eyes.) In Arrival, she is so tender, so luminescent, so engaging that to do anything but empathize would be virtually impossible. On three particular occasions we found ourselves completely absorbed, feeling physically what she was portraying on screen, be it disorientation, fear, or love. She feels completely authentic, never forced or actorly. Jeremy Renner is great here, too, a surprisingly earnest turn not seen since, coincidentally, American Hustle (or The Town, or Hurt Locker). He’s definitely not in “Hawkeye mode,” and that’s a delightful reality. I’m about fed-up with superhero flicks, and there are 18 more coming in the next 24 months. Egad. Forest Whitaker is pitch-perfect, reserved and low-key, avoiding his often distracting affections and tics, the sort that can kinda ruin otherwise great movies like The Butler or even experiments that become classics like 1999’s Ghost Dog: The Way of the Samurai. He avoids the head-bob and blinky eyes that invoke "confused puppy." Also, if you loved Sicario (hands down one of the best films in the past 24 months), you’ll be super-stoked to know that director Denis Villeneuve is helming Arrival, giving it similar gravitas and a deep, melancholy vibe that leaves you thinking as you shuffle out and wander to the car. Arrival is a rather atypical, non-traditional sci-fi film. This may confound you until you see it, but it actually reminded us—emotionally—of the way we felt watching Ang Lee’s Life of Pi or Terrence Malick’s Tree of Life. (And before I forget, do catch Lee’s Billy Lynn’s Long Halftime Walk this weekend. More on that in coming days.) All three films, not unlike Contact and Interstellar, orient themselves around quests for meaning and purpose. No small odysseys, to be sure, but when wrapped like bacon around a linguistic mystery, well, you’ve got yourself one killer kabob that clocks in at just under two hours. We think you’ll love the tone (which is alternatingly intense and methodical, and *almost* always engrossing), the music (we’ve already pre-ordered the soundtrack from iTunes, out this Friday), the cinematography (which has that soothing blue-grain international feel we loved in The Accountant or Alejandro Iñárritu’s haunting 2010 existential masterpiece, Biutiful), twisty visual effects that leave you wanting more, and a mysterious triangle that'll tickle your gray matter. We can almost promise that your mind will enjoy s t r e t c h i n g to put the pieces in place before they fall on the floor, splayed out before you. It’s true, there are some moments you may feel the film lagging, but by the end you will have appreciated the slack, like a good, aimless, meandering coffee with an old friend, the sort that comes gentle and easy, not hastened or forced. 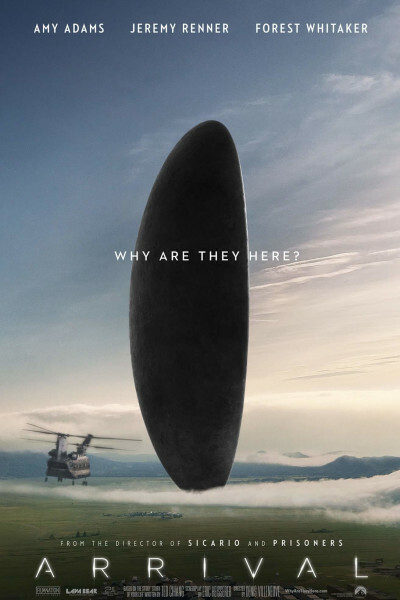 Our mutual concern is that with a vague, amorphous title like Arrival, and minimal “buzz” due to a market saturated with election coverage and hangovers at the height of football season, the film might die a slow, quiet death, à la Contact or Interstellar, so our hope is that folks will get out and enjoy it. We anticipate you’ll be pleasantly surprised, yep, precisely as we were, by a film that invites you to solve a mystery…with aliens…and a linguist…accompanied by a periodic archer…here a Los Alamos mathematician…all while chillin’ to a cello-laden soundtrack with lotsa Close Encounters of the Third Kind tones and thuds. If that won’t get you to the theater, well, we don’t quite know what will. Do give it a shot; we trust you’ll be glad for its arrival.